Last month I received an email from work asking employees to adopt a child from a local orphanage. It is the time of the year when we should be thinking about the less fortunate. We want to sponsor a child from the [home] this year. We have a wish list with 27 children between the ages of 10 - 14 years old. We have two gift tags per child one for toys and for clothes. 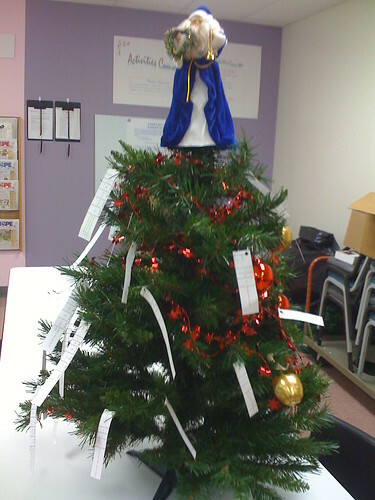 We have put a Christmas Tree in the cafeteria with the wish list. The gifts should be labeled with the child name and please use gift bags instead of wrapping paper. You generosity will be greatly appreciated and needed by the less fortunate children in our community. Deadline to drop of the gifts is Monday, December 15th. Guitar Hero for the Wii? How unfortunate is this kid? 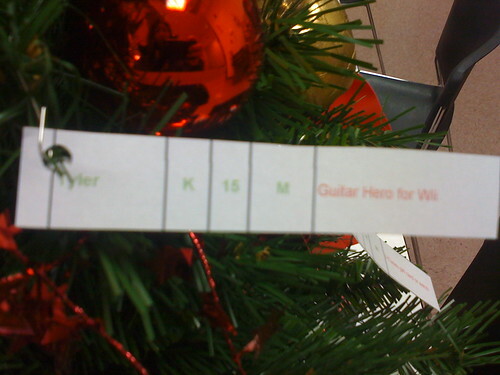 He already has a Wii and many "fortunate" kids don't even have Guitar Hero. There tags for other expensive items like a Nintendo DS. Such gall! There was such a backlash from the employees of our company that the tags just remained on the tree. I thought some more about it and realized that the Wii is probably owned by the home and the kids share it. And just because they are asking for extravagant gifts does not mean they are not unfortunate. Not having parents is something unimaginable for me and my family. Anything that would put a smile on these kids faces would be worthwhile. Besides, who else is there to buy gifts for them? So I ended up picking the Wii Super Smash Bros. Brawl for a boy from half.com (new for $30 including shipping instead of $49.99 from a store), and a "clothes" item for a girl. She wanted a clock radio and a Fossil watch. Of course I had no idea that Fossil watches are status symbols that are pretty expensive. They didn't carry it at Target (that's my criteria for too expensive). 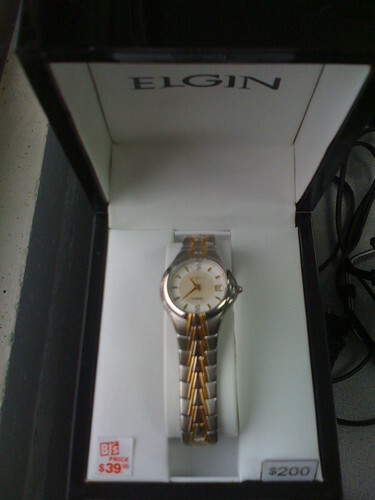 So I ended up finding this Elgin watch at BJ's Warehouse Club. It had a classic beauty that even I would be proud to wear. I hope she feels the same way. It had small diamonds too. And what a deal, a supposed $200 list price for only $39.99. I checked back at home and Elgin watches easily retail for twice as much as I paid. I also gave her the receipt just in case she didn't like it. ...We understand that some of the gifts requested are expensive items. Just a suggestion: Perhaps you could get together with some of your co-workers or your department and pick one tag off the tree for one child. It would be less expensive for all to contribute to one gift. What? I didn't have to go spend the big bucks and could have split it with someone or cop out with a gift card? Well, what's done is done, and I should get better karma for being extra generous, right? Still this email didn't help the number of tags still left on the tree. Finally on the due date for the gifts, we received this email. We still have 15 children with no gift this Christmas. The kids will appreciate a gift card to any of the shopping stores like Target - TJ-Max - Walmart - Chunkys. The deadline to drop off the gifts has been extended until Monday, December 22nd. I guess the economic climate is so bad that no one wants to be generous. Our company is experiencing a drop in sales and we have a hiring and travel freeze. The tree was taken down with tags still left on it. There were even simple items like jeans from Old Navy. I work with a bunch of Scrooges!